Don’t “Duh” me please. And why would you say “Duh”? Because it took me this long to figure I can make my own moldings. Until the last couple of years I only made things where I could use stock moldings from the big box store. That beginning point limited me severely and I could only do things which were going to be painted or where finger joints are acceptable (a small portion of fine woodworking to be sure). I finally figured out from watching Mr. 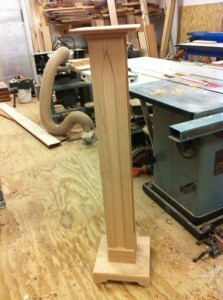 Norm and then getting a good router table in my shop that I can make many very nice moldings out of any wood I choose. And I don’t have to paint it or try to explain to all my friends that finger jointing is a tree saving environmentally correct methodology and the reason I am charging more for my work. Over the past couple of months I have been making some small furniture pieces for my church and I wanted them to match the existing pulpit furniture. Both of the latest pieces are from oak, one red oak and the other quarter sawn white oak. Needless to say, there are not many custom moldings from those two species and I really wanted them to match. 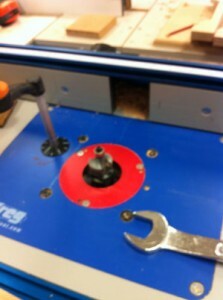 A few months ago, I purchased the Kreg router table with a new Triton Router from Highland. What a beautiful setup that is. I already had a set of half inch router bits and I figured I might as well try the molding process. It worked!! I came up with some beautiful stuff and it made the finished project look good. What works for me is to plane a board to a good thickness and then rout one edge (or both edges) by running it at the router fence. I then cut the molding off the edge of the board at the table saw and it is done. I can make as much as I want and it is always the right size and species for the project. Miter it up, nail it up and stand it up. 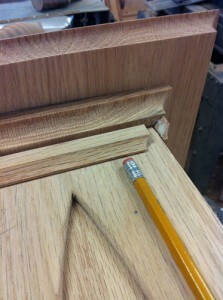 One of the great joys of woodworking is doing the final fit of those last little delicate moldings on a project. There is a timelessness about it which feeds my soul, particularly when I think about spending an extra half hour doing something really well, so people a hundred years from now will touch it and run a finger along it and recognize that someone cared enough to do it really well. Isn’t that why you do woodworking?